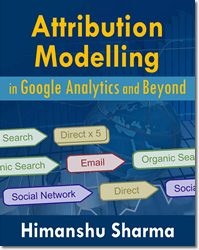 This article is in conjunction with the article: Understanding Channels in Google Analytics where I explained the concept of traffic sources, medium and channels in great detail. 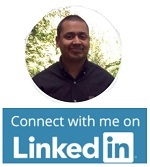 I also explained, how to create your own marketing channels in GA. If you have not already read that aritcle, then I would suggest you to read it first. The knowledge acquired through that article will help you greatly in understanding the concept of channel grouping. 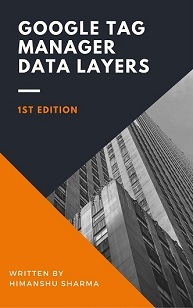 In this present article, I will take you one step further and show you how to create and use channel grouping for advanced data analysis. Channel grouping is a rule based grouping of marketing channels. 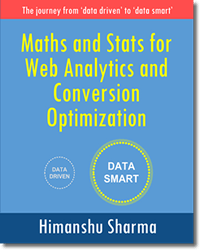 1) To change the way Google Analytics label and aggregate the incoming traffic for advanced data analysis. 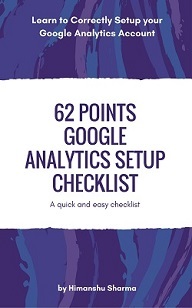 2) To quickly check the performance of a set of marketing channels or set of traffic sources. 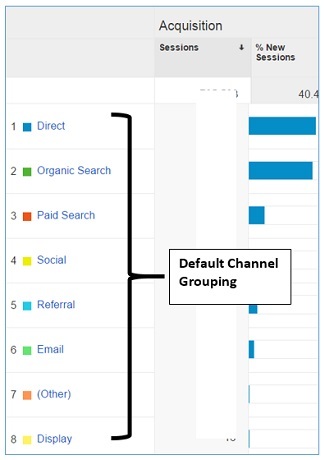 Default Channel Grouping is a rule based grouping of default marketing channels. Step-3: Let us suppose you want to change the definition of ‘Social’ channel. 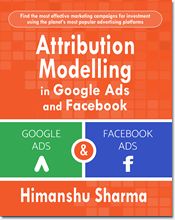 You want the traffic coming to your website from traffic sources like Facebook, Twitter, LinkedIn, Google+ etc to be all labelled as ‘Social’ Traffic. you can redefine ‘Social’ channel by using a different dimension (i.e. a dimension other than ‘System Defined Channel’). Step-6: Click on the ‘Done’ button and then on the ‘Save’ button. Note: Avoid changing the definition of default marketing channels unless you are absolutely sure what you are doing and how to interpret the reports going forward. 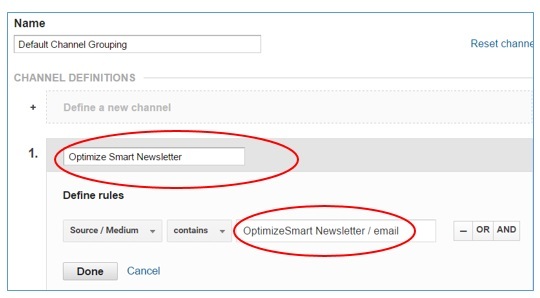 Here I have created a new marketing channel to measure the performance of optimize smart newsletter. 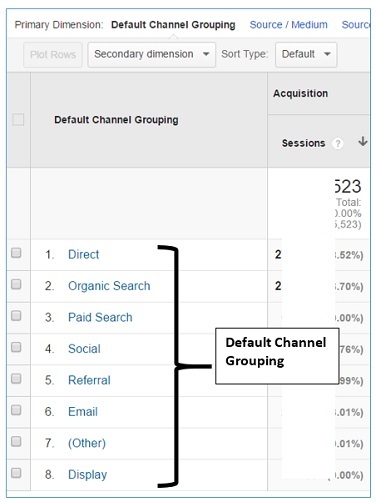 Note: Avoid adding new marketing channel(s) to the default channel grouping as it can inflate your aggregate data if you are not very careful with your setup. 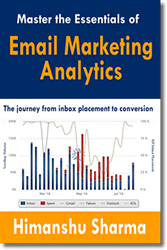 For example if you are adding a new marketing channel for your newsletter to default channel grouping then make sure that the ‘Email’ marketing channel does not contain traffic data from your newsletter otherwise GA will count your newsletter traffic twice while computing aggregates. The rule of thumb is, if you are not 100% sure about your set up and how to interpret reports going forward, avoid adding new marketing channel(s) to your default channel grouping. Avoid redefining default marketing channels. 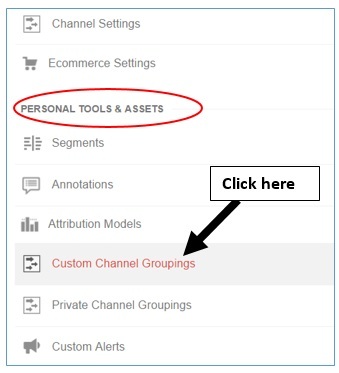 Instead create and use custom marketing channels and custom channel grouping. Step-3: Click on the ‘Done’ button and then on the ‘Save’ button. 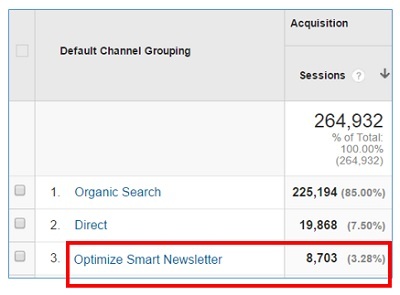 Note(1): Don’t remove any default marketing channel from default channel grouping. 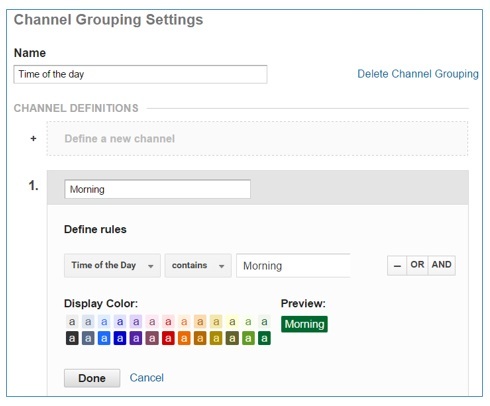 Whatever changes you want to do, do it in a custom channel grouping. 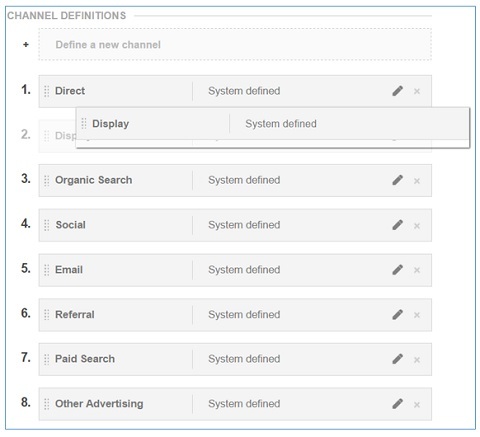 Keep default channels and default channel grouping intact. 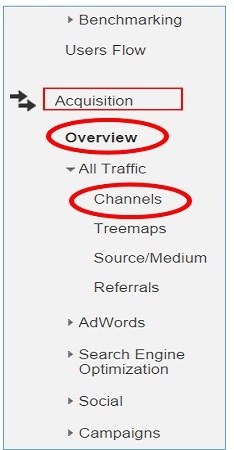 Note(2): Any change to default channel grouping, permanently change the way new traffic is labelled in GA reports. However this change does not effect the historical data. 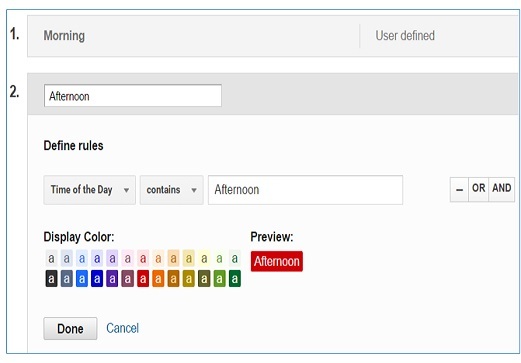 Custom Channel Grouping is a rule based grouping of user defined marketing channels. 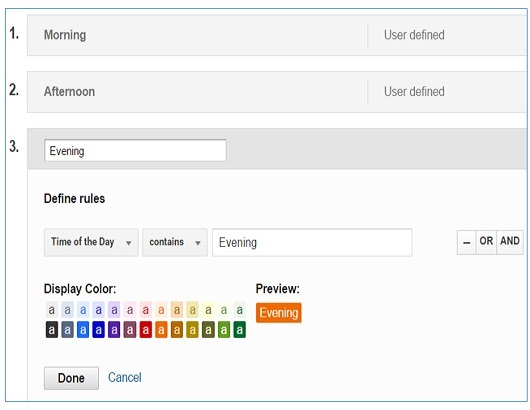 For the sake of explaining how a custom channel grouping can be used in a real work situation, I would create a new custom channel grouping called ‘Time of the Day’. 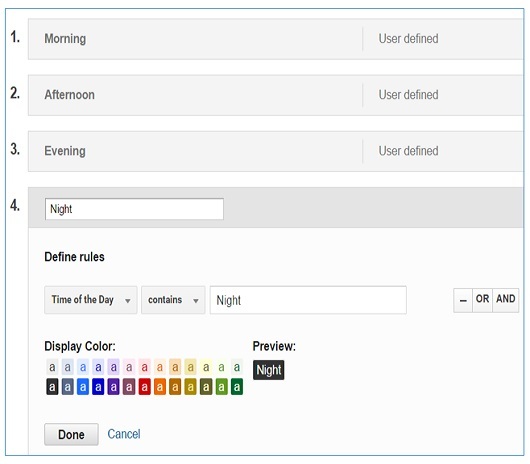 Here ‘Time of the Day‘ is a custom dimension which report on the time of a day (Morning, Afternoon, Evening and Night) when a user visit your website. This time is based on a user’s local time and not the time configured for your GA account. From the report above, we can conclude that majority of users visit the website in Afternoon, followed by Morning, Night and Evening. 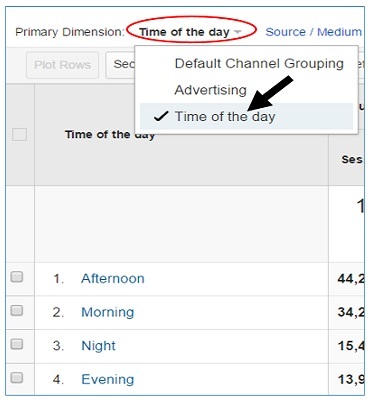 You can also determine the time of the day when users convert/purchase the most and if you are planning to run a time sensitive campaign, then this information would be of great help to you. This is the kind of insight you can get from a custom channel grouping. 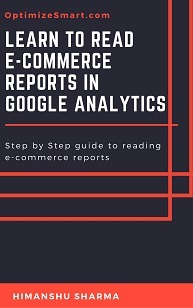 Note: Custom channel grouping can be applied as primary dimension or secondary dimension in Acquisition > Overview report and in Acquisition > All Traffic > Channels report. 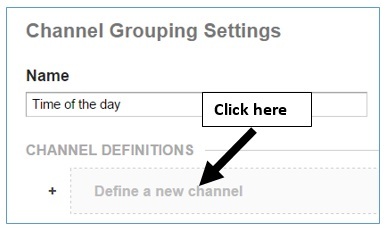 Note(1): When you create a new custom channel grouping in a view, you can apply it retroactively(i.e. you can apply it to historical data). But when you edit a default channel grouping, you can’t apply it retroactively. This is one big advantage of using custom channel grouping instead of editing the default channel grouping. 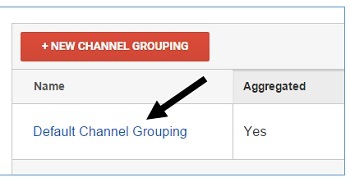 Note(2): You can also copy and share default channel grouping. But you can’t delete it. 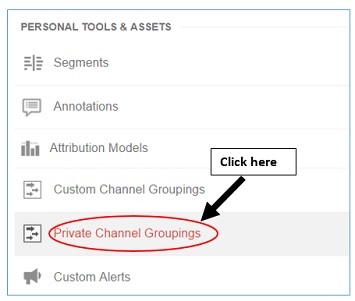 Private Channel Grouping is a rule based grouping of user defined marketing channels which is visible to only that user in a view which created it. 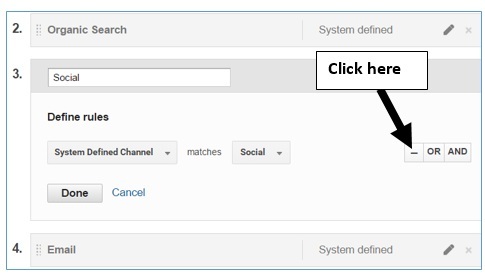 Step-2: The rest of the steps are similar to creating a custom channel groupings. 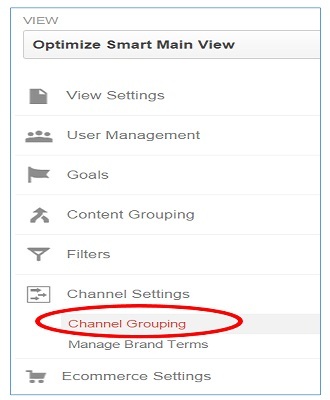 If you recall, Channel grouping is a rule based grouping of marketing channels. 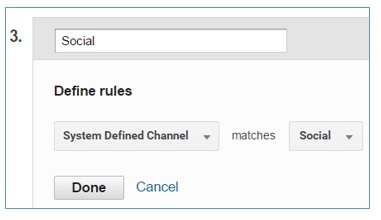 Default channel grouping in GA has got 8 rules. These rules decide how the channel grouping should work. These rules are executed in the order in which they are defined. So the first rule that will execute is for direct channel and the last rule that will execute is for Display. Since the first rule is for Direct channel, GA will look for all the traffic sources whose traffic source is unknown and bucket them under ‘Direct’ channel for reporting purpose. 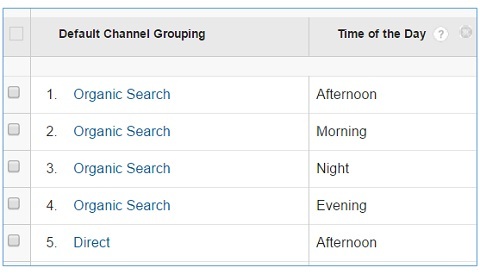 Since the second rule is for organic search channel, GA will look for all the traffic sources (other than unknown traffic sources) whose medium is organic and bucket them under ‘Organic Search’ channel for reporting purpose. Similarly all other rules will be executed in the order in which they are defined. 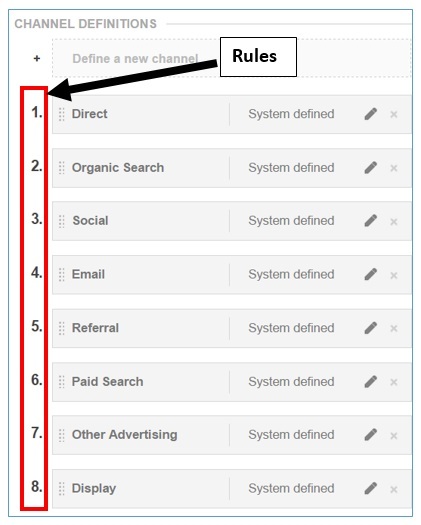 Again avoid changing the order of default marketing channels in default channel grouping. If you have the need to change the order then make a copy of the default channel grouping, give it a new name and then change the order.